Cream cheese filled chocolate cupcakes; moist cupcakes filled with cream cheese and chocolate chips. It’s that time of year again in our town… church fall festivals. Every year at this time the churches around our town start having their fall festivals. There are country markets, quilts, games for the kids, raffles, and cake walks, just to name a few of the fun things going at these festivals. This year I signed up to bring cupcakes for one of the kid’s games. Years ago my mom gave me several recipe books that she had collected through the years. She was weeding out some of the ones that she no longer wanted and giving them to whoever wanted them. Of course, I took a few of them. Some of the recipes are outdated, but there are still several recipes that I like to use. I found a simple chocolate cake in one of these cookbooks that I decided to use. I did change a couple of things and dressed it up with a cream cheese filling; the cupcakes were super moist and tender. I just hope that the kids that get these cupcakes enjoy them. 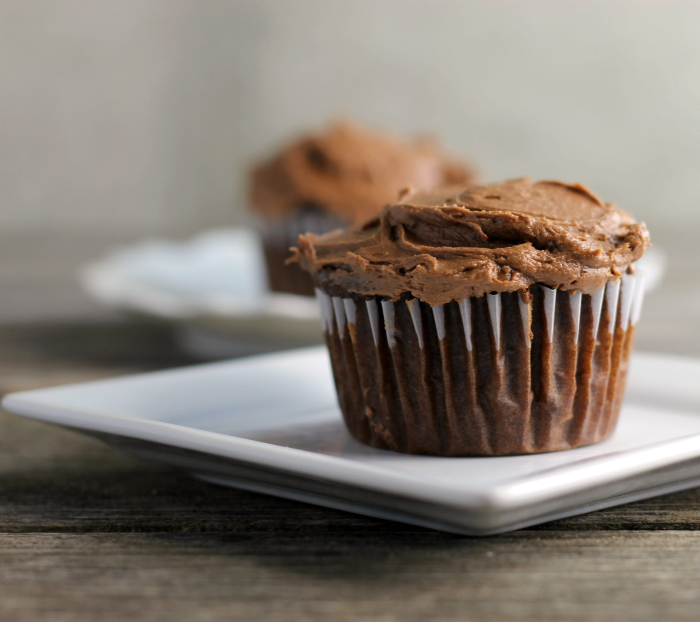 The recipe is made in one bowl and you probably have everything in your pantry and fridge for this cream cheese filled chocolate cupcakes. I love recipes like this one, it is nice when you don’t have to rush out to the grocery store to pick up special ingredients. I hope you love these cream cheese filled chocolate cupcakes as much as I do. For the cake- In a large bowl add the flour, sugar, baking soda, 1/2 cup cocoa, and salt and mix together. Add the vegetable oil and buttermilk blend in with an electric mixer. Slowly add the boiling water as you keep mixing with the electric mixer. The batter will be very thin. For the cream cheese filling - In a medium bowl add the cream cheese and mix with an electric mix until fluffy. Add the sugar and beat in. Add the egg and beat in. Fill muffin tins that are lined with cupcake papers to 2/3 full. Add a small teaspoon of cream cheese filling in the middle of the batter. Place the cupcakes in the oven bake for 20 to 22 minutes or until when touching the top of the cupcake it springs back. Frosting- To a medium bowl add the powdered sugar, butter, vanilla, and sour cream. Start out mixing the frosting slowly until the powdered sugar and butter is combined. Add the cocoa and beat until fluffy. 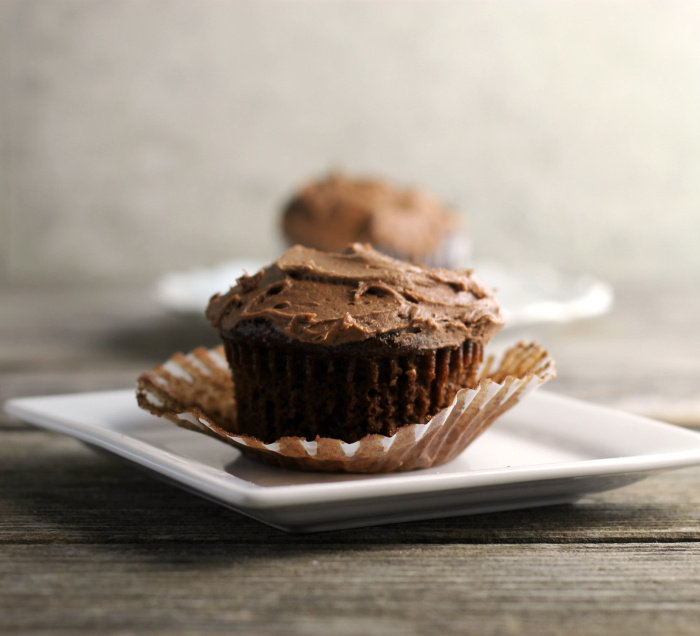 Frost each cupcake with a generous amount of frosting. 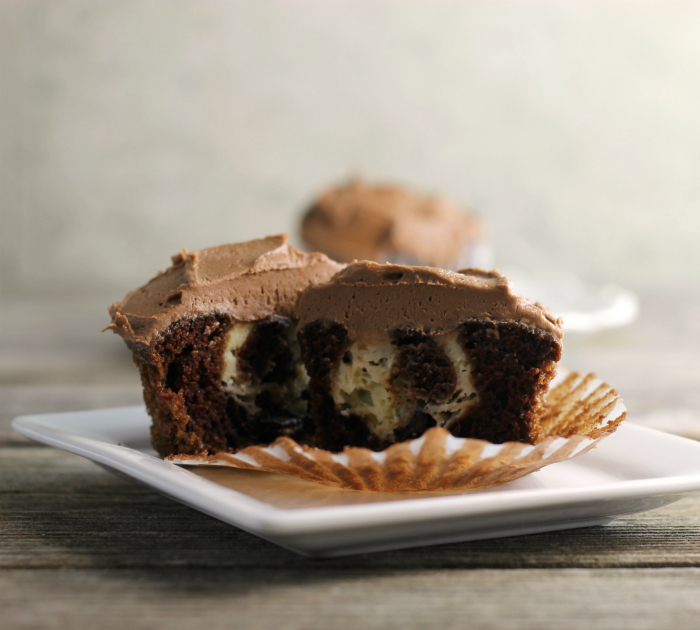 Cream cheese in a chocolate cupcake sounds soooo good. I have added these to my to do list! 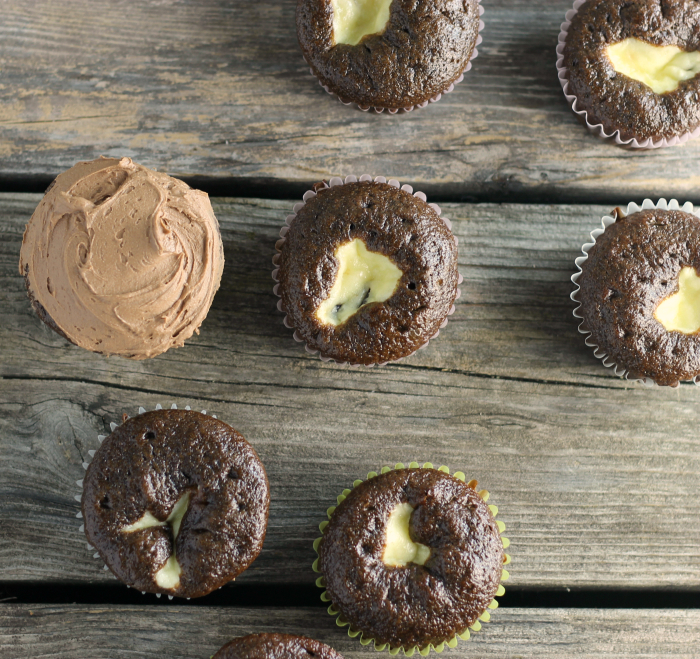 I’ve made mini cupcakes like these—but adding frosting make them even better! What a yummy dessert! Oh these sound amazing, Dawn! I know I would be one happy kid if I got one of these cupcakes! 🙂 I don’t think I’ve ever had a cupcake stuffed with cream cheese…and now I feel like I’ve been missing out. I need one of these bad boys ASAP! These cupcakes sound and look very delicious. They remind me of cream cheese swirled brownies. Love looking through old cookery and bake books.